The website's annual contest attracted entries in nine categories, including health & safety/cleanup, water, wastewater, software/SaaS, and air quality & climate. 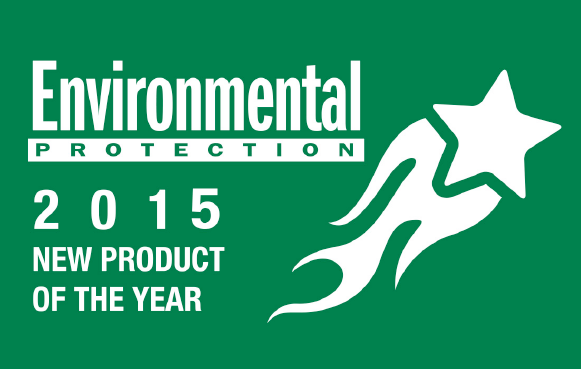 DALLAS, Jan. 25, 2016 – Six companies, including multiple-category winners ParkUSA and New Pig Corp., were recognized today for winning Environmental Protection's annual New Product of the Year contest. The contest attracted product entries in nine award categories, with an independent panel of three highly qualified judges choosing the winners. "Our 2015 contest attracted high-quality, innovative entries in every category, which is one more encouraging sign that the environmental marketplace is dynamic and growing. The competition was strong this year in categories such as health & safety/cleanup and wastewater," Editorial Director Jerry Laws said. "I congratulate all of the entrants on their fine work and thank them for participating. 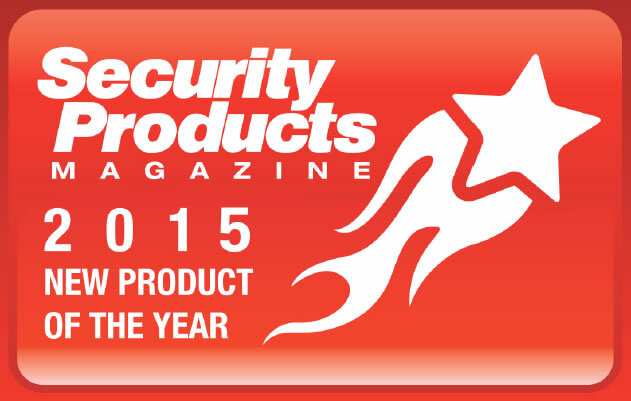 We hope they'll enter our 2016 contest, as well." In addition to being honored today, the winners will be featured on the Environmental Protection website www.eponline.com. Every January, the International Consumer Electronics Show (CES) brings entrepreneurs, manufacturers, retailers and techies to Las Vegas to see the latest gadgets and innovations from big companies and tech startups. 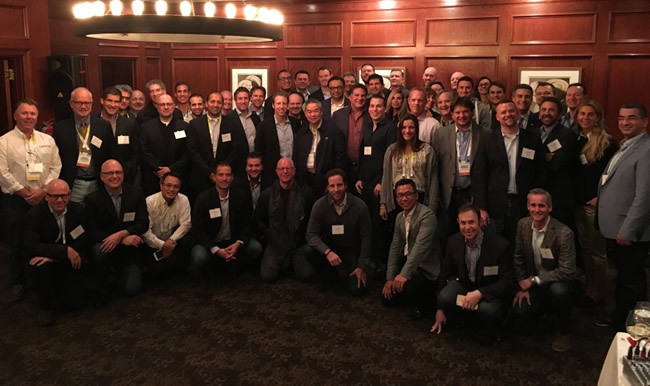 Rajeev Kapur, a member of Young Presidents’ Organization (YPO) since 2007, hosted an exclusive networking event for 90 business leaders from around the world during CES 2016, featuring discussions with Consumer Electronics Association Chairman Daniel Pidgeon (a YPO member in Dallas), Atom Factory CEO Troy Carter (a YPO member in Los Angeles), and John Shalam, founder of Audiovox Corp.
From innovations in robotics, televisions, cars and more, Kapur, CEO of 1105 Media, shares his top eight insights from the 2016 conference. The drone and robotic economy is here to stay. It is no longer a question of if drones and robots will be available to individuals but when they will be. "The Jetsons’ integrated home and those types of products are becoming a reality now," says Kapur. Autonomous drones and programmable robots will come in all shapes and sizes for many varied purposes over the next five to 10 years. For example, AirDog, a personal drone, tracks via a wireless network an adventurer’s movements while snowboarding, rock climbing, etc. and snaps photographs along the way. Another product, the 360fly works similar to a GoPro, except that this action camera takes all the 360-degree pictures desired. Advances are also being made in artificial intelligence and assistants like the Segway Personal Robot that may someday surpass the live versions. There’s a lot of promise in virtual reality. Although virtual reality has a lot of potential, the technology is not quite there yet. Kapur believes it is at the developmental stage 3D TV and imaging was at five years ago, but that it will continue to improve every 15 to 18 months. "I worry if virtual reality won’t take off in the home, much like 3D didn’t, but I can see applications for it in the medical and the business-to-business fields." Imagine how useful it will be for, say, a surgeon in Berlin to virtually attend and consult on an operation in Los Angeles. Virtual reality gaming is another trend many companies are banking on; however, it still makes users dizzy and nauseated, which may deter potential gamers. Considering how much Facebook invested in Oculus for its Rift headset, many techies believe that after a few more years of experimentation and technological advances, virtual reality will indeed become a mainstay in the future. The television is disappearing on the wall soon. That sci-fi Star Trek dream of rolling up a screen or having it magically disappear is getting a little closer to reality. LG created the 4K OLED TV, just a few millimeters thick, almost like wallpaper, with performance capabilities as good as anything else on the market today. "Imagine having wallpaper that you can program from your phone to wake you up with the sounds of Malibu beach," says Kapur. "It’s just amazing what the OLED technology is going to do for the future and how that’s going to change people’s lives and the types of experiences they can have." Wearable technology is getting more purposeful. The wearable space is beginning to craft gear that is not only easier to use but also essential for healthier living. Wearable technology is going beyond the smart watches and fitness trackers like Fitbit and appearing on everything from clothing to yoga mats. The emerging wearable fitness and health technology is particularly noteworthy because it promises to change how we exercise and communicate, and “is designed to keep people healthier,” says Kapur. Digitsole, for example, has basically embedded technology that charges wirelessly directly into the shoe so you can measure your footsteps and shock absorption and heat up your feet all at the same time. Sensors are at the core of future innovations. CES predicts the market for sensor technology will reach $6.5 billion in 2018 but it is no longer relegated to the wrist. Many of the future innovations rely on sensors to provide faster, easier solutions to everyday problems. DietSensor, for example, launched a pocket-sized sensor, SCiO, that can scan the food on a plate and send the nutrition and calorie data directly to the corresponding app, eliminating the need to manually input information. Expect the sensor economy to grow on the consumer as well as the business-to-business side. The new car that could all by itself. The way people get around will continue to change with the development of connected vehicles and autonomous cars. It is likely that in the next seven to 10 years the need for a driver’s license will not exist. Imagine the next generation sending emails or texting or making calls while an autonomous car safely takes them to work, scary today but real in the coming years. The advances in the pedestrian detect and collision avoidance technologies are particularly worth watching. "It will cut down on the volume of traffic accidents, which in turn will cause car insurance rates and the number of emergency room visits to drop," says Kapur. "And as a result, productivity and efficiency will rise." Data prediction is the next big business. "The business to go into is the big data, business intelligence, predictive analytics business," says Kapur. "All of that information from connected devices, like the thermostats and the wearable technology to the cars and sensors is all going up into the cloud." With the accumulation of data, companies will need to begin to interpret the data to improve quality and to predict what’s going to happen next. August, a vendor of smart locks with video cameras, door usage data as well as video analytics that can be used, for example, to predict when solicitors are most likely to visit. "There’s an old saying in business, if you can’t measure it, you can’t manage it," says Kapur. "Now there are tools out there so you can measure it." The emergence of even more precise data will most likely impact the organizational structure of businesses as well, causing IT and marketing departments to merge in an effort to provide more exceptional customer experience and efficient businesses. As new technological innovations continue to transform society, companies will need to become educated on how to begin to translate the steady stream of data feedback into creating products and services that better suit the lives of their customers. 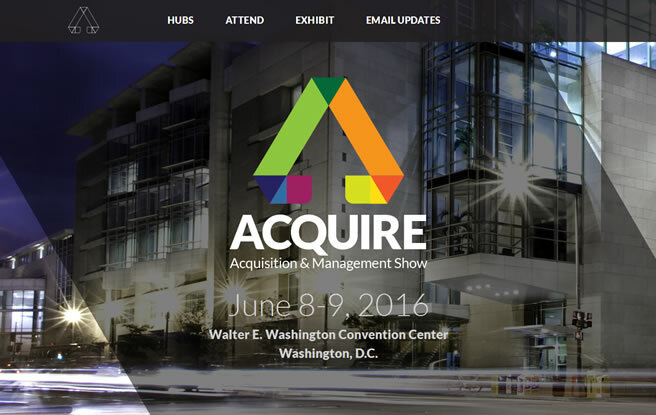 (VIENNA, VA, January 15, 2016)— Registration is now open for ACQUIRE 2016, a new educational conference and tradeshow for government acquisition and management professionals, taking place June 8-9 in Washington, D.C. Produced by the same editorial teams behind the FCW, GCN, Washington Technology, Defense Systems and Federal Soup media brands, this event will feature a variety of training courses from a diverse range of government agencies, impactful keynotes, an exhibit hall packed with vendors—plus educational clinics on the show floor, book signings and more. ACQUIRE also includes the Happy Fed pavilion that is dedicated to helping federal employees achieve a balanced, fulfilled and happy work life. Attendees can register at https://ACQUIREshow.com/register. "With more than 200 exhibitors and 7,000 acquisition and management professionals expected to participate, ACQUIRE will bring decision makers from every government department and agency together in one place to experience the latest in innovation," said Carmel McDonagh, Chief Marketing Officer of 1105 Public Sector Media Group. "We're excited to offer in-demand training, interactive demos and clinics and invaluable networking opportunities for attendees that will cultivate more efficient and successful programs." (VIENNA, VA., January 14, 2016)- 1105 Public Sector Media Group and technical partner Booz Allen Hamilton are pleased to announce a new event to be held on February 16, ‘Network-Centric Warfare: Next Steps Toward Achieving The Vision’. The event will be co-located with WEST 2016—co-sponsored by AFCEA International and the U.S. Naval Institute. Today’s battlespaces—sea, air, land, and cyberspace—are networked like never before, and information superiority is essential to military success. However, the evolution towards truly network-centric warfare has been slowed by technical and cultural challenges. This event, produced by Defense Systems, FCW and technical partner Booz Allen Hamilton, will bring together Department of Defense (DOD) leaders and experts including keynote Rear Admiral David H. Lewis, Commander, Space and Naval Warfare Systems Command (SPAWAR), U.S. Navy, to discuss the current vision of network-centric warfare and steps the Department and Navy/Marine Corps can take to achieve it. "The concept of network-centric warfare is more complex than ever, as DOD seeks to integrate cyberspace and the electromagnetic spectrum with the traditional battle domains of land, air, sea and space," said Kevin McCaney, Editor-in-Chief, Defense Systems. "At this event, DOD leaders and experts will discuss how the department can overcome the technological hurdles and finally realize the full vision of network-centric warfare." "This event will provide a dynamic forum in which leaders from the Navy and Marine Corps can discuss strategies for overcoming both the technological and cultural challenges to achieving and capitalizing on the virtues of network-centric warfare in order to have secure and seamless C4ISR systems for mission success," said Steve Soules, Executive Vice President and Lead, Navy/Marine Corps C4ISR, Defense & Intelligence Group, Booz Allen Hamilton. (VIENNA, VA., January 8, 2016)— 1105 Media, Inc. is pleased to announce that Anne Armstrong, Co-President & Chief Content Officer, 1105 Public Sector Media Group has been honored at the CES Government conference in Las Vegas. Both Armstrong and Stan Soloway (former Professional Services Council (PSC) President) were given awards recognizing their leadership and commitment to the Public Sector market. "Individually or together, Anne Armstrong and Stan Soloway have no peers in terms of the broad and positive impact they have had, and continue to have, on our government tech sector." said Don Upson, Chief Operating Officer Unicom Global and CEO, Upson Technology Group, who manages the Government Business Executive Forum that produces the CES Government Conference. Armstrong was part of the editorial team that launched FCW and the Federal 100 and has always been at the forefront of issues impacting the business of government. Sage Communications Executive Vice President Steve Vito agreed. Noting that he'd been her competitor and colleague at different times, Vito said, "Whether a champion or a critic, [Armstrong] holds an uncanny grasp of the important issues impacting this important business." (VIENNA, VA, December 21, 2015)— 1105 Media, Inc. and the Professional Services Council (PSC) are proud to announce a strategic partnership with PSC as the Founding Partner of the ACQUIRE Show, a new two-day educational conference and tradeshow for government acquisition and management professionals produced by 1105 Media, Inc.
ACQUIRE's mission is to help government agencies create, manage and run successful programs and focuses on three key OMB spending categories: Information Technology, Professional Services and Office Management. Thousands are expected to attend the show in June 2016 to take advantage of the education, training and professional development offered for each stage of the program lifecycle (strategy, acquisition, implementation and program management). PSC is the leading advocate and resource for the federal technology and professional services industry, representing the full range and diversity of the government services sector. "This powerful partnership brings together two leading teams and respected providers of information and services for the government market," said Anne A. Armstrong, Co-President & Chief Content Officer, 1105 Public Sector Media Group. "Since the idea of the ACQUIRE Show was first born, we have been looking for a partner with a reputation of excellence and an established relationship with many segments of the government market. We believe PSC is a perfect match." "1105 is right on target with ACQUIRE and we are delighted to be a Founding Partner with them," said Stan Soloway, President & CEO of PSC. "The combination of acquisition and technology pavilions at ACQUIRE opens the door to a wide array of creative and substantive ways to explore the challenges to, and opportunities for, enhancing the delivery of technology and professional services to the Federal government. That speaks directly to PSC's core mission and focus and aligns PSC perfectly with the ACQUIRE objectives." PSC is the voice of the government technology and professional services industry. PSC's nearly 400 member companies represent small, medium, and large businesses that provide federal agencies with services of all kinds, including information technology, engineering, logistics, facilities management, operations and maintenance, consulting, international development, scientific, social, environmental services, and more. Together, the trade association's members employ hundreds of thousands of Americans in all 50 states. See http://www.pscouncil.org. Follow PSC on Twitter @PSCSpeaks. (VIENNA, VA, December 4, 2015)— 1105 Media, Inc. announced today that the ACQUIRE show's IT Pavilion's Platinum and Gold sponsorship levels have sold out. Sponsors include exclusive IT Pavilion Platinum sponsor Akamai Technologies and Gold sponsors Four Points Technology, LLC, Management Concepts, Pyramid Analytics, Unisys, Vision Technologies and World Wide Technology, Inc.
ACQUIRE, produced by the same teams behind the FCW, GCN, Washington Technology, Defense Systems and Federal Soup media brands, will take place June 8-9 at the Walter E. Washington Convention Center in Washington, D.C. The show will feature multiple training courses from a diverse range of government agencies, a variety of informative breakout sessions, visionary keynotes, an exhibit hall packed with vendors representing 3 specific OMB spending categories - Professional Services, Office Management and Information Technology - plus educational clinics on the show floor, book signings and much more. ACQUIRE will also feature the Happy Fed pavilion that is dedicated to helping federal employees achieve a balanced, fulfilled and happy work life. "The sponsorship support in the IT pavilion has been overwhelming to date. We are delighted to see that our highest exhibit levels on the show floor have already sold out in the IT pavilion." said Carmel McDonagh, Chief Marketing Officer of 1105 Public Sector Media Group. 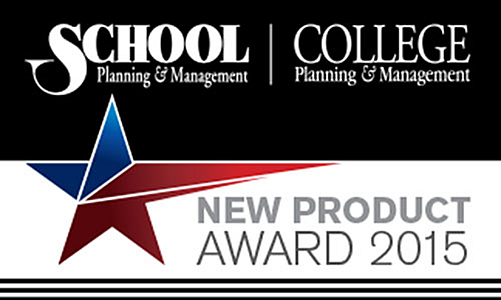 "We knew from the start that building a show focused on creating a more effective and efficient acquisition and management process in government would resonate in this market and we are glad that the community agrees." (VIENNA, VA, November 9, 2015) - 1105 Media, Inc. today announced the deadline for submitting training proposals for ACQUIRE 2016, taking place June 8-9 at the Walter E. Washington Convention Center in Washington, D.C., has been extended to Friday, November 20. The Call for Government Training Courses opened to government agencies on October 7 and to private industry on October 14. ACQUIRE show management has since been overwhelmed by the number of requests from agencies for additional submission time. Extending the deadline will allow these agencies to receive necessary approval on their training submissions. "The conference team has been overwhelmed by the number of positive responses they have received, and we want to ensure agencies have plenty of time to submit their training courses so that we can build a comprehensive program," said Anne A. Armstrong, Chief Content Officer at 1105 Media. "We want to make sure every government agency and industry subject-matter expert who offers training to the government is able to join us." Produced by the same teams behind the FCW, GCN, Washington Technology, Defense Systems and Federal Soup media brands, the conference program will feature training courses from a diverse range of government agencies, a variety of informative breakout sessions, visionary keynotes and educational clinics on the show floor. ACQUIRE will provide government agencies, as well as industry experts, an opportunity to engage federal and military personnel with education and training opportunities across five tracks: Acquisition Management, Information Technology, Office Management, Professional Services and Project Management. Strategists, managers, decision makers, buyers and end users from every government department and agency from across the country will be at ACQUIRE to take advantage of mission-critical training, earn CLPs and further their professional development. All government and military agencies and industry experts are invited to submit their training courses for consideration. There is no limit to the number of training courses you can submit. If selected, course(s) will be scheduled to take place during ACQUIRE, June 8-9, 2016, in Washington, DC.